On it's 90th birthday, Weston-super-Mare’s most iconic venue reopened to the public after an extensive £15 million renovation and refurbishment project. Being one of the largest venues of its kind in the South West, The Winter Gardens Pavilion, since the late 1920s has hosted many famous acts. 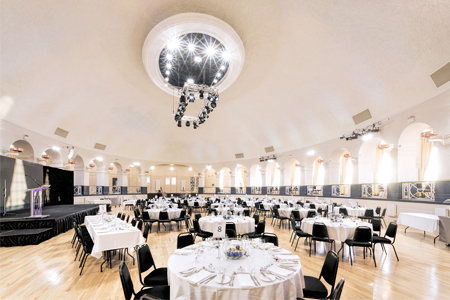 It features an impressive neo-Georgian ballroom, ideal for conferences, ceremonies and events, as well as a number of smaller conference and meeting rooms. SonaSpray K-13 applied over a reinforcement mesh during the refurbishment of the Winter Gardens Pavilion, Weston-Super Mare in order to acoustically treat and decorate. We have a range of 5 acoustic finishes from textured to the smoothest acoustic plaster available.